Feel the awe and curiosity the pioneers experienced when they saw the most famous landmark on the Oregon, California, and Mormon Trails. 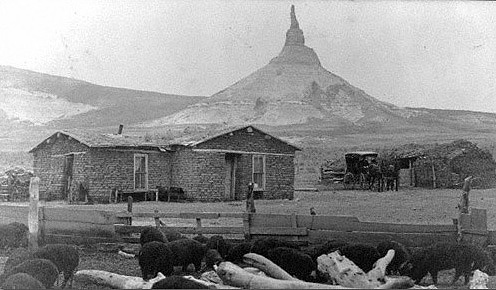 Designated as a National Historic Site on August 9, 1956, Chimney Rock is maintained and operated by History Nebraska. See museum exhibits, "pack your wagon" with provisions for the trek west, and learn more about the great migration in a fascinating video at the Ethel and Christopher J. Abbott Visitor Center. Books on trail history, educational games for kids, and unique craft items from the Chimney Rock Gift Shop let you take “a piece of the rock” on your journey. Chimney Rock has fascinated people since before the state of Nebraska was established. Our collections include many paintings, sketches, and photographs of Chimney Rock going all the way back to 1841. 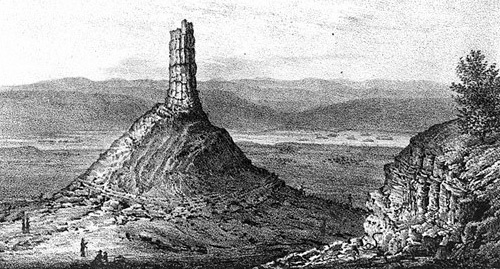 Chimney Rock was an important landmark for overland westward migration. Our artifact collections reflect that with many objects that came to Nebraska as a result of overland migration. See a selection of the most interesting artifacts here. How Tall is Chimney Rock? Believe it or not, Chimney Rock today is actually smaller than it used to be. It's been over a century since the first curious Nebraskan tried their hand at measuring Chimney Rock.